With the publicity machine for Ready Player One kicking into gear, we though it time to look at some films that have based themselves on the ideas and aesthetics of video games, while not being based directly on them. 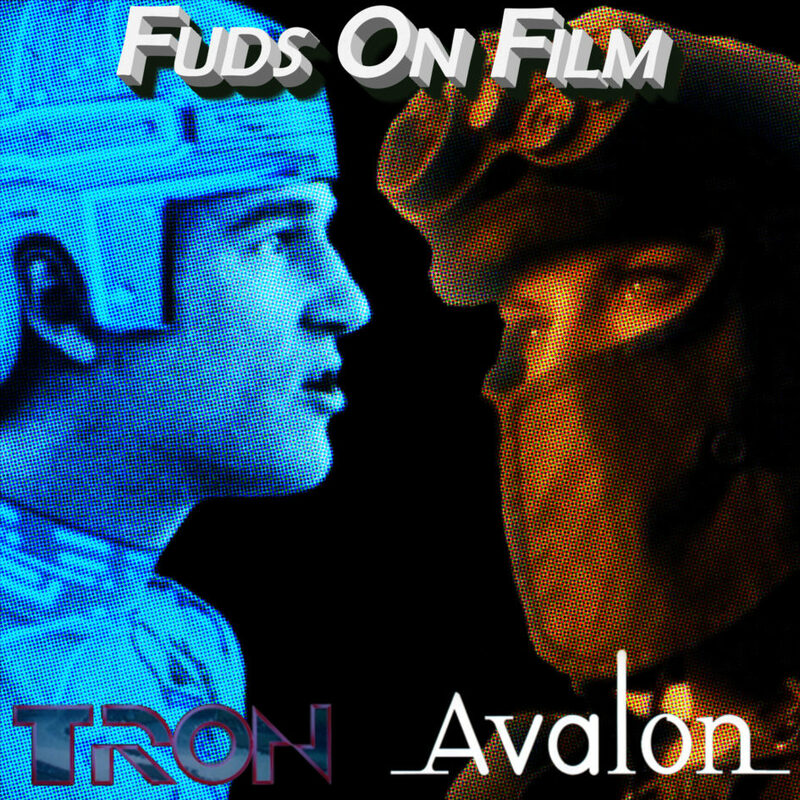 To that end, listen now as we run through the ups and downs of Disney’s Tron and Mamoru “Ghost in the Shell” Oshii’s Avalon. It’s a thing you can do, that’s for sure. The past is a foreign country, they do things differently there. In this instance, 1982 is a foreign country, and the U.S.A. is also a foreign country. I’ve not thought this introduction through, this is getting confusing. What I’m trying to get at is that Disney’s Tron came out in 1982, which, in terms of computer technology development, might as well be categorised alongside the abacus. It feels as though Tron needs little introduction, but I should bear in mind that new, non-Tron aware humans are created by the day, and that on its release Tron rather underwhelmed, so some introduction at least seems warranted. Kevin Flynn (Jeff Bridges) runs that most missed haven of our youth, an arcade, by day while trying to hack into the systems of ex-employer ENCOM by night, hoping to find the proof he needs that he’d been defrauded. Fellow employee Ed Dillinger (David Warner) stole the games he’d been working on and released them to great success and acclaim, quickly rising to become the face that runs the place. Flynn has sympathetic friends still at ENCOM, chiefly Bruce Boxleitner’s Alan Bradley and Cindy Morgan’s Dr. Lora Barnes, but he’s unable to penetrate the firewalls of the Master Control Program, an artificial intelligence Dillinger was using to consolidate control of various computer systems both inside and outside the company, but it rather seems as though the MCP may now be running Dillinger, rather than the other way about. Convinced that the only way through the security will be to physically access ENCOM’s networks, Flynn convinces Bradley and Baines to sneak him into the facility: at this point fans of computer science and physics accuracy in movies had better stop listening. While Flynn’s poking around, the MCP fires off an experimental laser that digitises Flynn and drops him into the computer system, represented here as a bunch of dudes and dudettes wandering around in neon outfits, doing… something, I suppose, while jackbooted thugs of the fascist MCP police state keep most of them in a state of terror. Singled out for particular attention are those computobods who still profess to believe in the “Users” responsible for their creation, with their hokey religions and ancient weapons. What follows is, well, not exactly as my motherboard’s trouble shooting guide goes. Flynn is captured and thrown into a series of gladiatorial games where he fights for his life, before being busted out by Tron (Boxleitner), Bradley’s security program, kicking off a chase that sees them try to shut down the MCP while avoiding the forces arrayed against them through a variety of means that make for interesting enough set pieces, but don’t stand up to a lot of academic rigour. A “solar-sail simulation”? Whit? Tron, it turns out, is one of those films I’m convinced I’ve seen a dozen times, but turns out to be a dozen different ten minute stretches when it was on telly before changing the channel to find something a bit more interesting, and so it turns out this might well be the first time I’ve watched it from start to finish. I don’t think I appreciate it much more for seeing it all in context, to be honest. It’s not that I dislike Tron, and indeed there are a few things to like. The actors are all charming enough in their roles, but primarily the film’s selling point is, of course, the visual effects. These are so abstracted and stylised that they hold up pretty well today. I think primarily because it’s worked out a pretty cohesive visual language for the computer world and stuck to it that it’s convincing, if not realistic, if that makes any kind of sense. It’s legitimately impressive to this day. Certainly, it doesn’t seem all that less visually interesting than 2010’s Tron: Legacy, which, given the strides effects work has made since then, is pretty remarkable. Unfortunately most of the other aspects of Tron, I am somewhere between not bothered with or actively dislike, which very much brings the average down. Actually, perhaps the only thing I really dislike is Wendy Carlos’ soundtrack, which I do not get on with at all – it sounds like a synthesiser being tortured with a cello. I could get over that if there was a compelling narrative to back it up, but Tron‘s is, well, not nonsensical, exactly, but a close relative of nonsensical. It’s just a bunch of fetch quests leading to a boss battle, which I suppose fits the “inspired by video game” theme quite well. However, given that for all their supposed narrative sophistication you can’t cull a decent film from modern video games, what hope do you have of pulling one out of light cycles? The standard discourse on Tron these days appears to be to give it plaudits for its ground-breaking effects work and ignore everything else, and if you can somehow attune your expectations accordingly then there’s some merit in watching the film. However, it’s a narrative wasteland, and it very rarely displays any sort of human emotions so there aren’t a great many levels on which to enjoy it other than the visual. Honestly, you’ll get the best of the film by watching a trailer for it on YouTube. From Mamoru Oshii, the mind behind anime series Ghost in the Shell and Patlabor among others, cometh Avalon. Named for the isle of Arthurian legend that homes the spirits of brave warriors slain in battle, this Avalon is an online VR game that occupies a good deal of society in the apparent near retro-future of some indeterminate Central European state (Poland. It’s Poland). Accessed via appropriately over-engineered headsets, the game world is an escape for great numbers of a disillusioned populace, and the best players can even make something of a living out of their pursuits. On the other hand, ill-judged sorties into missions highlighted as being of particular danger can leave players severely mentally afflicted, or “unreturned”, in the real world. Our nominal hero of the piece is Ash (Malgorzata Foremniak), a young woman with quite the reputation as a Warrior-class character in the world of Avalon. Formerly a member of a renowned team, Ash now plays alone following some mid-battle discord that left her team leader, Murphy, quadro-spazzed and on a life glug, though she is eventually drawn back into the clan life as details emerge of a hidden, “Special A”-class level that can only be accessed by the most elite of players, and which can only be escaped by completion; failure, in this instance, is very much not an option. Avalon was Oshii’s first non-animated venture, and it is immediately obvious that his anime madskills do not necessarily translate into the live action format. I was able to see Avalon back in 2001 in a limited engagement at a cinema in Edinburgh, and I immediately found engaging with the characters and setting nigh on impossible to the point I fought to stay asleep. I had hoped that this, my first viewing since then, might have yielded some greater satisfaction; surely my nascent critical faculties had missed something on that first pass which my more informed, adult self would appreciate? No? Shot on the super-cheap in Poland (presumably as a function of Oshii’s fascination with tanks and Hind helicopters), Avalon is at once visually distinctive on account of its then inventive “Caffenol and Vaseline” glamour glow-filtered sepia tones, though the fact Apple started including this look as a live filter in its devices a couple of years later has probably somewhat prematurely accelerated the ageing process of this particular aesthetic. The European architecture sits well within the overall look, and in terms of approximating the multiplayer map environment of any number of online shooters it’s a decent attempt; again, it’s just a shame this hasn’t remained as timeless as it might have. If the movie is, visually, a decent attempt on goal, then less successful is the choice of score – a ponderous, orchestral affair that continually evokes Arthurian imagery without actually having much point, and on more than one occasion seemingly serving only to pad out the running time as characters walk interminably along featureless corridors, stern-faced and vacant. My suspicion is that Oshii imagined such indulgence might bring great, unspoken emotional resonance to what is otherwise a largely uninspired, emotionally disengaged story… but it doesn’t. It just makes such scenes seem like really pretentious student catwalk shows. Chief among Avalon‘s failures, however, is that it just doesn’t have much reason to exist. While Tron succeeds as a ripping adventure yarn with an iconic visual aesthetic, Avalon has absolutely no such credentials, and in terms of story it certainly has little if anything to say about an emergent human condition precipitated by the advance of technology. It’s a bit of a let down to say the least, especially when you consider that it was Oshii’s first work in six years following the seminal Ghost in the Shell. I’d forgive this were the story compelling, or the underlying themes intriguing, but Avalon, again, as far as I’m concerned, doesn’t have a lot to say for itself. It feels very much like it thinks that it does, particularly with its final act shenanigans, but I can’t for the life of me extract much from it at all. This all sounds rather negative, probably more so than I intend to be, as it’s more a film I find a bit dull and confusing rather than one I dislike. I think mainly it’s the disappointment that stings the most – I’d hoped for another Ghost in the Shell (anime) and got, well, Ghost in the Shell (live action). I’d probably recommend this to anime fans only, and perhaps even then only the subset of Mamoru Oshii completists – there’s certainly some joy to be had for this narrow group in seeing his live action work and comparing his approach here to his animated work. Outside of those happy few, though? Probably skippable. If you’ve been affected by any of the issues discussed today, please hit us up on Twitter (@fudsonfilm), on Facebook (facebook.com/fudsonfilm), or email us at podcast@fudsonfilm.com. If you want to receive our podcast on a regular basis, please add our feed to your podcasting software of choice, or subscribe on iTunes. If you could see your way clear to leaving a review on iTunes, we’d be eternally grateful, but we won’t blame you if you don’t. We’ll be back with you on the 20th with another grab bag of film reviews but until then, take care of yourself, and each other.